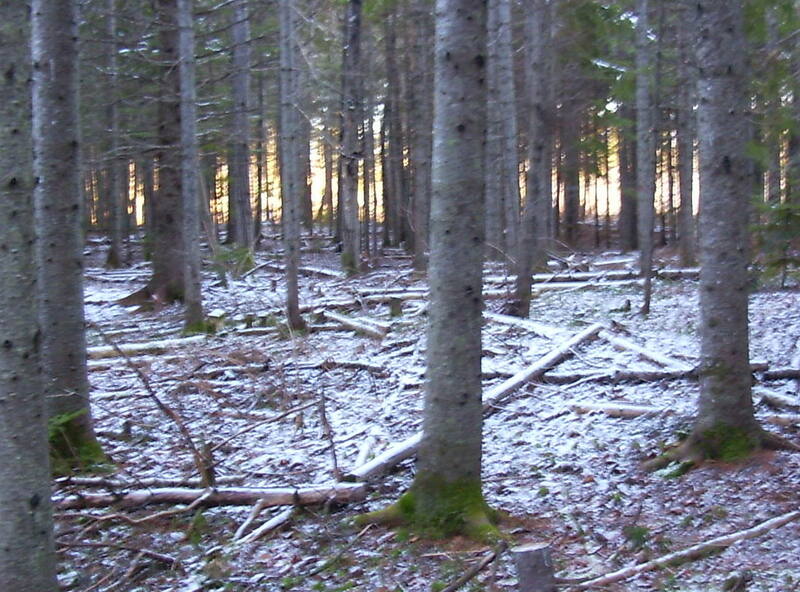 My husband and I had a most wonderful walk in the woods yesterday. The sun was shining and the temperature was just right. We had a lovely quiet day to ourselves. Here I am wearing the wool leg warmers that I just finished knitting. After lunch, I finally got all the borders on my little scrap quilt. I'm not sure I'm perfectly happy with where the flying geese ended up. I wanted them to be quite asymmetrical in their placement but it didn't quite end up that way. I am terrible at measuring and planning. It's not worth it to rip it all out though. 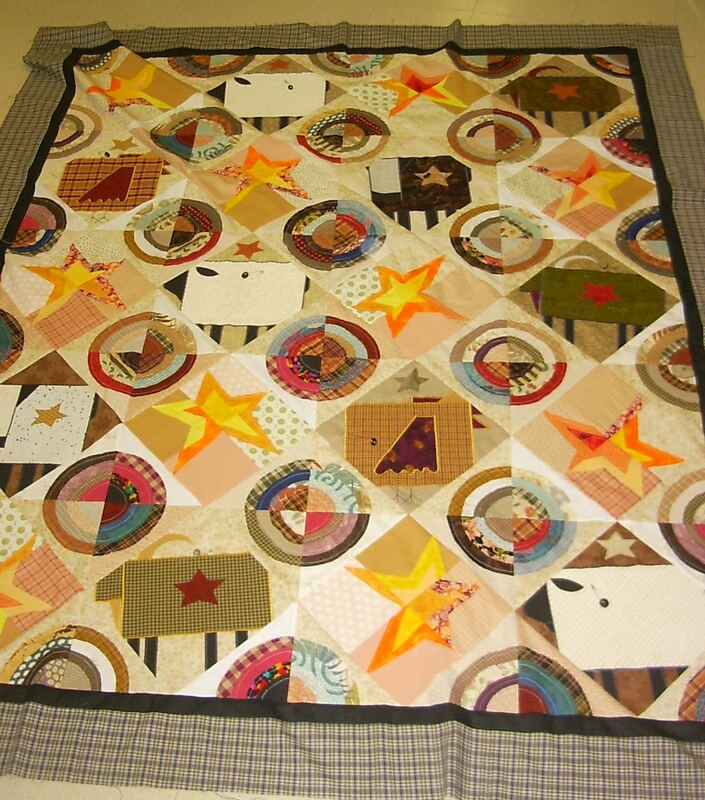 I'm done with it until I have to quilt it which I think I will attempt on my basic sewing machine. 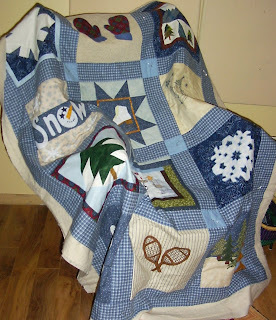 For now it's going into the closet, as I still have my winter quilt to finish machine quilting. It was another beautiful day today. Since I don't like to walk 2 days in a row due to knee and hip problems, we decided to do a few errands downtown and go for lunch at the cafe. Gord planned to spend the rest of the afternoon puttering outside when he got a 'call in' to work. He is supposed to be on vacation but I guess there was no one else to call. It really messes up the week though. 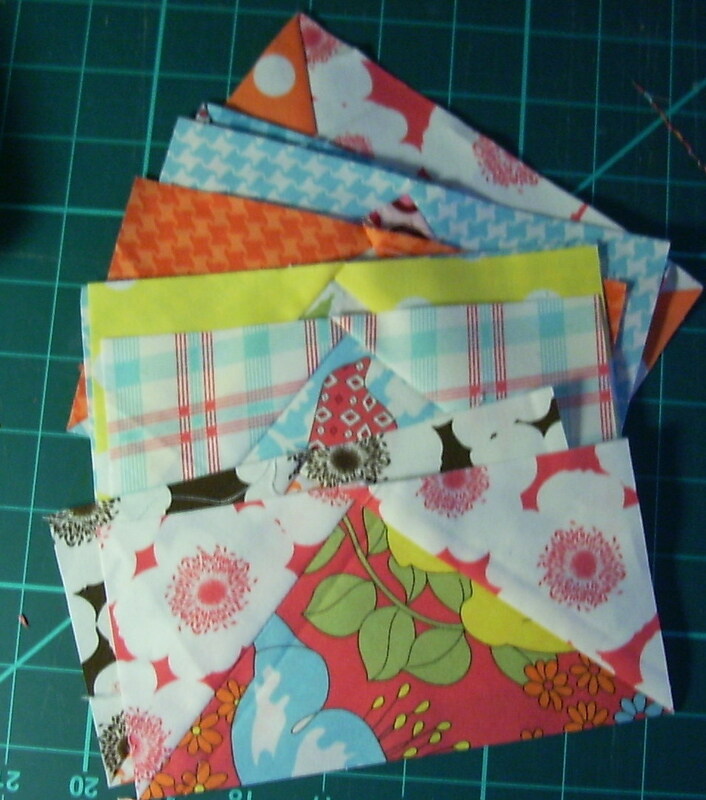 So, I'm going to spend the rest of my time in my sewing room where I'm cutting pieces for a another small quilt. Our house is empty once again except for my husband and I. My youngest left yesterday and my eldest with his fiance today. We had a lovely few days. For the first time in a few years, I was not sick, nor was anyone else. On the day of our big blizzard we all went to the spa. It's only 2 minutes from home. We swam in the salt water, lolled in the hot tub and steamed in the sauna while the storm raged outside the windows. Once home, we cocooned. 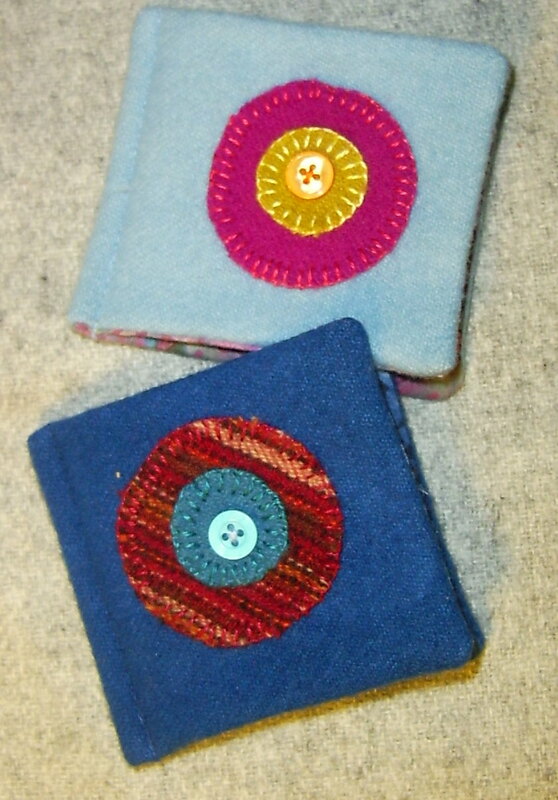 While some napped and read, I sewed. I've almost gotten the final borders on my quilt. I'll show it later. Since I wasn't working, it enabled me to get a few things made ahead, so we spent less time in the kitchen cooking. We went for walks, played games, and we watched movies. Everyone pitched in for the dishes, so I felt like it was totally relaxing. I missed my daughter, but she has sent us a quick email from the resort in Vietnam every day. What more could one ask? It was a lovely time. I'm just going to show a picture of a gift that I did for my oldest son who likes to garden. I carried it home one day from our downtown waterfront. 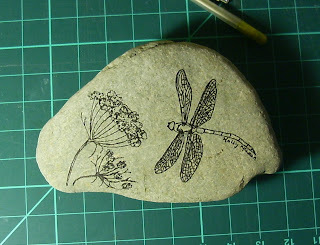 My mother-in-law found the dragonfly on her deck and saved it for me. 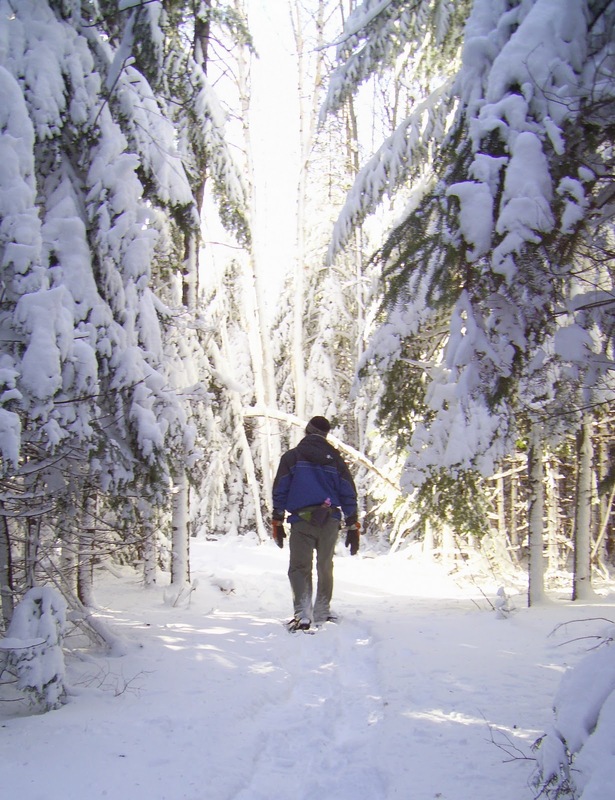 I'll be back soon, but now we're going to get ready to go snow shoeing. 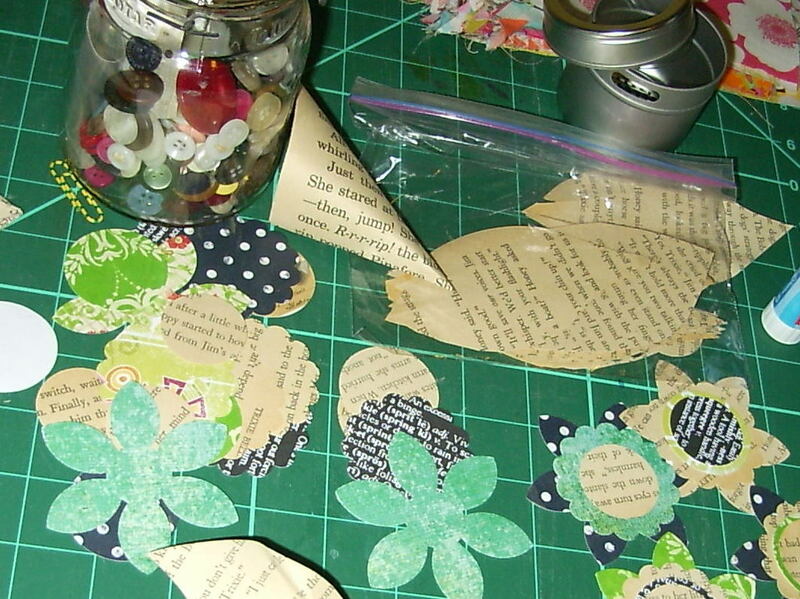 I have turned my sewing space into a wrapping station for the moment. This year, I have managed to stick to my pledge to keep things simple and not over do the gift giving, so I do not have a lot of wrapping to do. Yesterday, I took the time to go to my Wed swimming at the spa, and then I did a couple of small errands and met my usual Friday lunch group fro lunch and our annual gift exchange. I was tired out when I got home, as I often am after swimming. I made myself a cup of my low fat, low sugar version of chai tea and spent some time here in my sewing room with my knitting. One of the gifts I received was a snowflake made of wire and buttons in my favorite lime green color which I had to put on my tree right away. My turkey is cooking as I write this. Following a recipe from a blog, I will layer my turkey with some broth and the stuffing in a lasagna dish tomorrow and simply warm it up on Christmas Day. I also just made a butterscotch sauce for my pudding. I have to pace myself so I don't have too much to do when the family (16 people) will attend for dinner on Saturday. Everyone is bringing something so that really helps to make the day more relaxed. We'll all be able to spend more time with our families. As many people do in their fifties, I have really been trying to simplify my life and to find ways to spend time quietly and with family enjoying nature and the simple things. Yoga and meditation have been a part of this journey which I will continue through the holidays and into the New Year. My youngest son arrives to-night and my eldest, sometime tomorrow. I likely won't get to my sewing machine now until next week and thus probably won't be posting anything until then. I would like to send wishes of peace out to everyone. Happy Holidays to all those who are celebrating. The weather people are predicting another storm and storm surge here tomorrow. We are getting rain right now, but it is supposed to turn to snow tomorrow. I really hope it does, as we have absolutely no snow right now. It just doesn't seem like Christmas without it. Today, was a good day--not a lot of pain or fatigue. I dropped some things off at the Volunteer Center and mailed my last 2 Christmas cards--I know I'm late. After lunch, I made Buried cherry cookies. I'm not doing much baking this year due to my blood sugar problems, but I've been told that I must do these. They are more of a standard than scotch cookies in our house. I apologize for the picture, and I've already frozen them so I can't do a retake. I found the very same recipe here. Later this afternoon, I had a nice cup of chai tea in my sewing room. I use loose tea leaves steeped in a warm mug of low fat soy milk. It is naturally sweet enough, so I don't add honey or sugar. I trimmed these flying geese to size for my border, and started putting them together. I got 1 1/2 done. 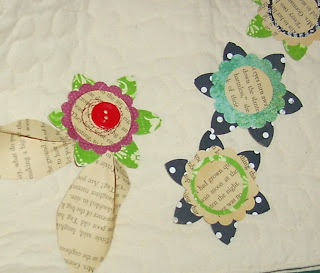 For any new readers, just to let you know that I'm more like the tortoise than the hare.I'll spare you another picture of the quilt in progress. I'll take one when I get the borders on. I haven't forgotten to write. My only excuse is that I've simple been tired. I'm quite careful not to take on too much this time of year, and I really do try to keep things simple and to take quiet time for myself. Inevitably, though when Christmas is this close, there are just more things to do. I meant to post on Friday, but I had one of those afternoons. It was a lovely day and I went for my walk on the trail. 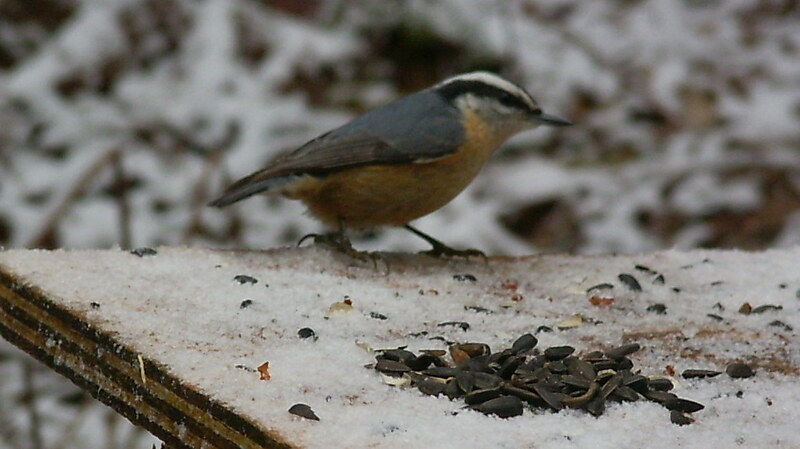 Including some time for feeding the birds, I was gone almost an hour. When I got home I realized that I had lost my key on the trail when I pulled out my camera. I had only taken it out once (the batteries died), so I knew where it was. I got a neighbor to run me back to the entrance to the trail and walked down to the area where I thought I had lost the key, and sure enough it was there. Then I had to walk back up the trail and home. By that time I had walked about an hour and a half which is a lot for me. Also, I did finally manage to get my tree up this weekend. I only do a 4 foot table topper, but it still seemed like a big enough task. 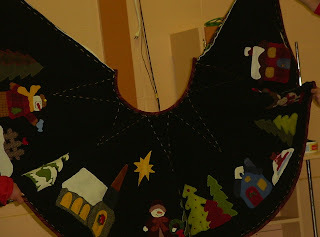 Yesterday, I went to the last guild UFO day of the year where I finished up a Christmas present and hemmed a tablecloth. The table cloth is run of the mill and I can't show the one for the gift. My husband and I walked the trail this morning and fed the birds. It was a crispy minus 2C, but lovely in the sparkling sunshine. We didn't get any more pictures of the birds because my camera quit on me! Thank goodness I do have a little cheap one a s a spare, so at least I can use it for a while. 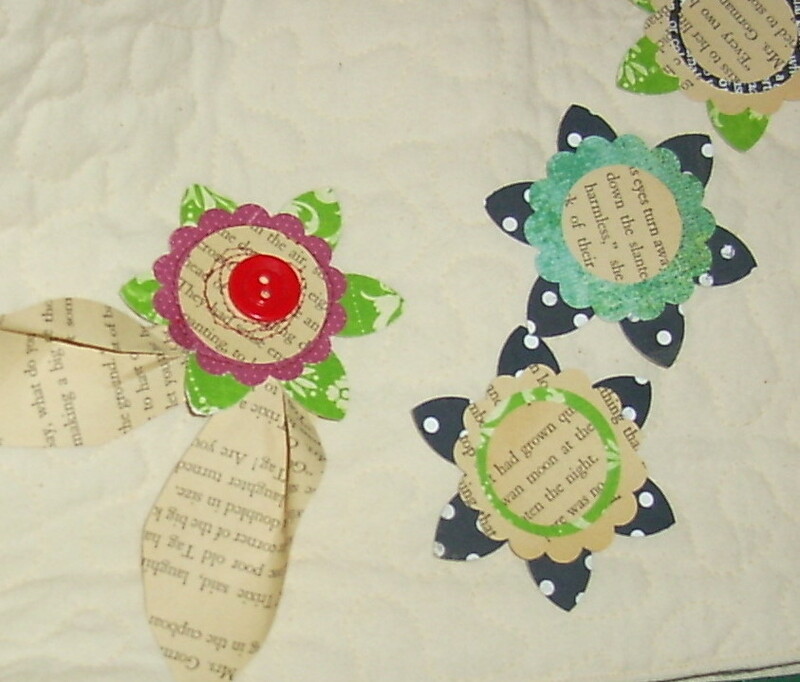 The only picture that I have is of a table topper that a friend made for me. I just love the colors and the shape. 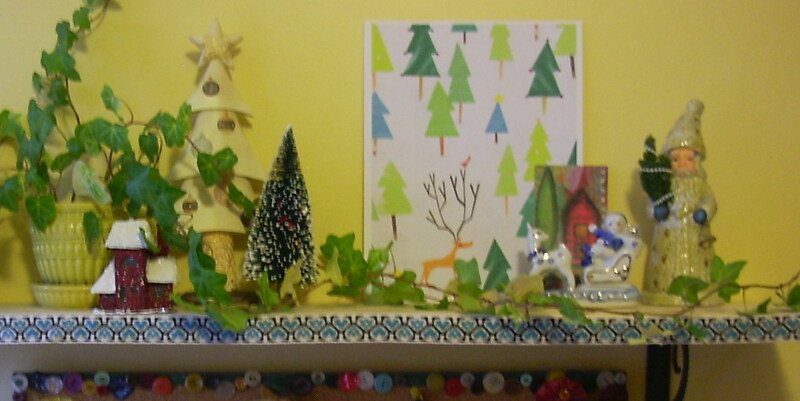 Since I have Christmas ones out right now, I decided to put it on the front of my little bookshelf in my sewing room. 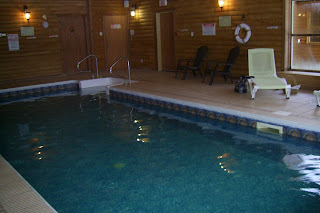 This morning I went with a friend for my once weekly swim and sauna at the Auberge. she asked me to come see her Christmas tree on the way home. For her grand children's delight, she covered the tree completely in stuffed animals. She even took the time to add details like a knitted sweater and other things to the animals. It was really special. Her husband made dinner while she was gone and they asked me to stay. After that I came home to my studio. The first thing I did was get the ironing done and cleared out. 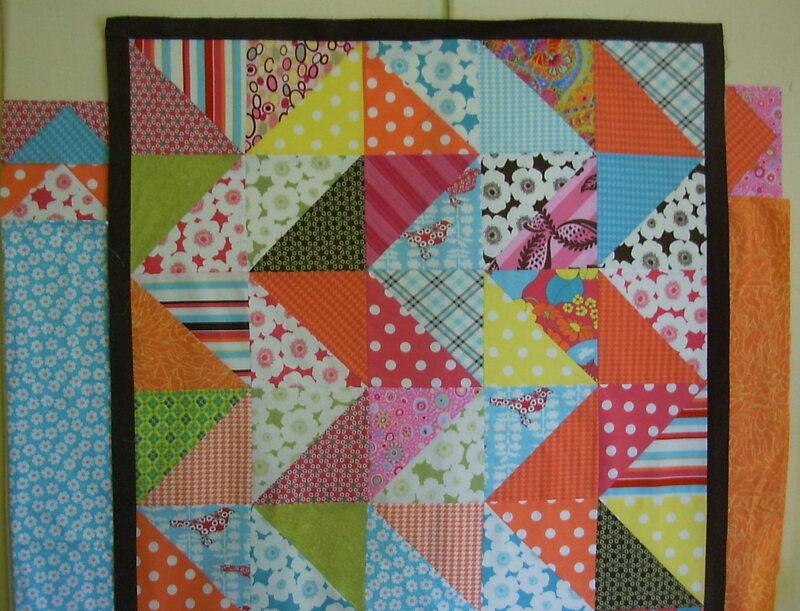 Then I put the first narrow border on the quilt. I've been thinking about Wanda's suggestion of Exuberent Color to add piano keys, but it just seemed like a lot of work! So that led to me asking myself what if I just do small sections of piano keys in the border? Finally, while swimming laps I mused about using up some of the smaller triangles that I still had left. I have put a picture below with 2 options. 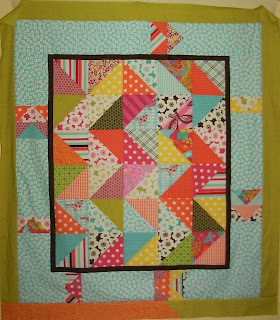 I'll do some flying geese blocks interspersed in the border but I have to decide which color and which way to turn them. If I opt for the orange, I have to turn them as pictured below due to the amount of fabric I have. If I choose the turquoise fabric I have enough to turn them the other way. I think I'm leaning toward the turquoise. The wait and the apprehension is finally over. I listened to too many people about how confining it is and how long it takes. I was nervous about it and I really wanted to get it done, so I took the relaxant. They also decided to give me 2 Benedryl just in case of an allergic reaction to the dye. The staff were very good and polite and went out of their way to make it comfortable. I had no problem at all and even almost fell asleep. The head attachment with the mirrors made the difference. So with anyone out there with claustrophobia don't be afraid! While I was waiting to go this morning I did a little Christmas decorating. Even though it was pouring rain outside it still put me in the Christmas mood. I even decorated my new shelf by my sewing machine with a few bits and pieces of favorites. The trim on the front of the shelf is vintage.. I tried 3 different pictures and still ended up with some fuzziness.The print with the trees and reindeer in the background was provided for printing by a blogger. I thought I knew whose it was but I can't find it. If I do, I'll let you know. Yesterday, I spent a very peaceful afternoon in mys studio putting my blocks all together. I have picked out the fabric for a narrow border--chocolate brown. The plan was to cut the borders and square up the quilt this afternoon, but I can barely sit up, I'm still so woozy! I got a little distracted as I always do if I check my email and any blog updates. I just had to stop and cut 3(2 shown here) of these snowflakes. I found the tutorial here . 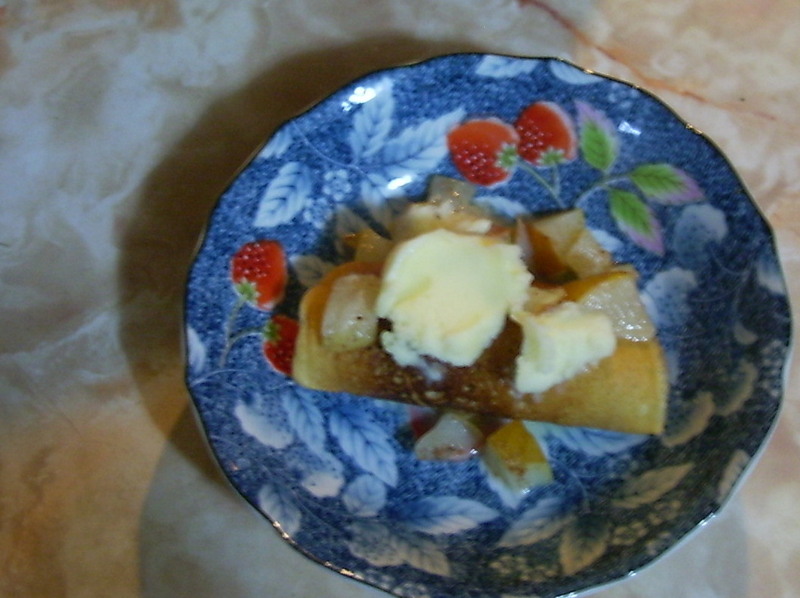 One other fun thing I did yesterday was to make dessert crepes. They are so easy and can be frozen. Then you can add any kind of fruit filling, add some whipped cream or frozen yogurt as we did. They are fairly lite but delicious. Beat with a beater till smooth. I used a non stick electric frying pan and an ice cream scoop. It takes about 2 tbsp batter--drizzle it outwards to about 6 inches while spreading it till thin. They cook on one side quickly. Flip and when it's light browned, remove it. It only take a few minutes to cook them all. This morning I had a return to do, and then I picked up a few groceries. Just before my lunch I talked to my daughter in Korea via MSN Live which is similar to Skype. It is so good to be able to talk to her and see her too. She won't be home for Christmas, nor will she for some time, but I shall be content to know she is enjoying her holidays. She is spending a week at a golf and beach resort in Vietnam. 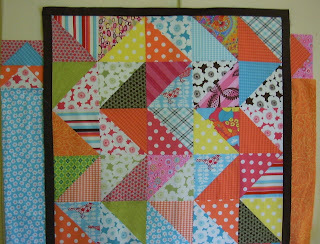 I spent the afternoon in my studio trimming the leftover blocks for the zigzag orange quilt. 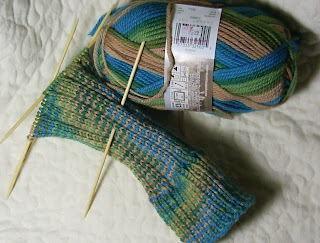 I laid them out and sewed one row. 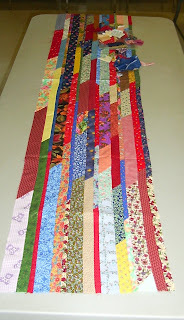 It is about 32" wide; therefore, I will be adding some borders. 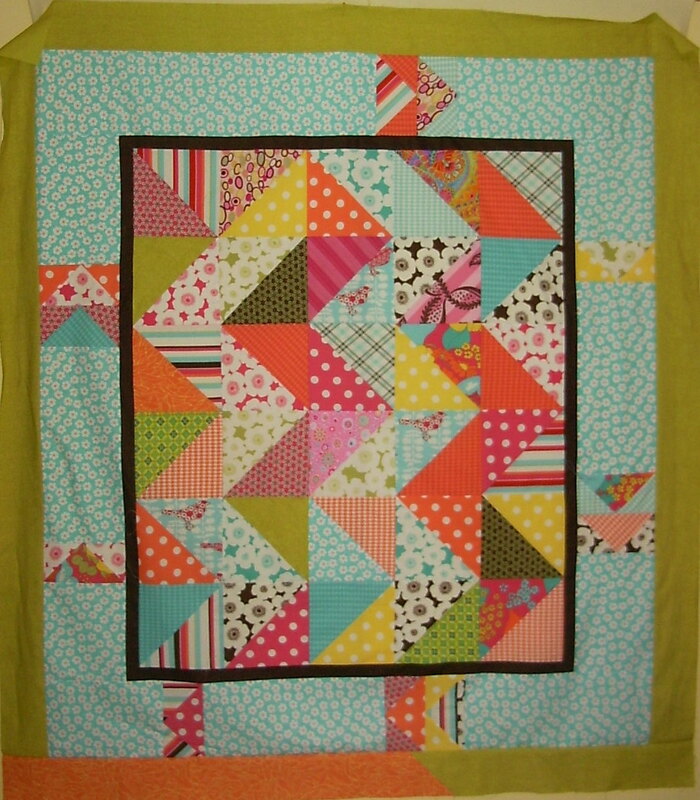 I'm trying to decide if I should try some kind of a pieced border, and I have no idea what, or just be done with it and put plain borders. 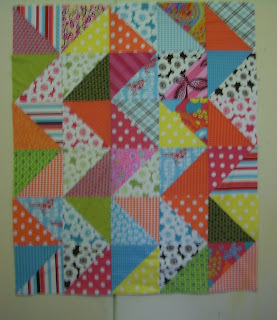 This is the second quilt with this fabric. I sort of run out of steam at this point, as I don't have a very long attention span. Then I painted a second nuthatch onto a watercolor paper card. I am still experimenting with my new printer scanner. I tried scanning it and taking a picture of it to see which was better. This is the scanned version printed onto card stock. The photo version came out darker, but I took it when the day was fading. Tomorrow, I think I'll try another photo when it's brighter. I have a hard time to put my feet up at any time and just do nothing. It seems my fingers need to keep busy. While I was out walking the other day, I decided that I needed leg warmers. 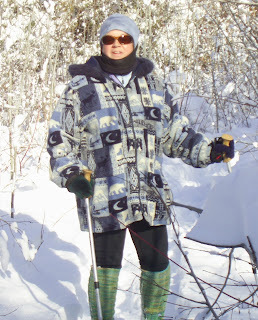 The pants that I wear are fleece lined with zippers at the back of the legs, and sometimes I can feel the cold there. It just so happened that there was a special sale night in our downtown shops on Wed night, so I bought the wool. It's Paton's-Classic Wool. 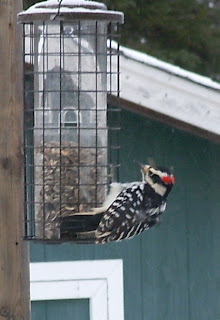 Here is the character that visited my feeder this morning. I went and did my weekly swim yesterday, and then I shopped for items on my daughter's list of things she cannot get in Korea. Her Christmas box has been in the mail for almost 2 months. This box that I mailed today will be there, I hope, for Valentine's Day. On Friday's, I usually do all my errands, including the library and meet my friends for lunch at our favorite cafe. It was the first really sunny day we've had in a couple of weeks, so when I got home around 2:30, I changed and went of a walk. You can see the sun glowing through the woods along my favorite trail. I always feed the birds and couldn't resist more pictures. 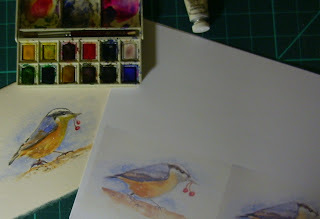 Last night I decided to have a go at quickly sketching and adding watercolor to this little fellow. He's not quite finished; I need lots more practice, but I'm satisfied for now. It is one of my intentions for the New Year to make more tome for this. I may even start now as I am finished most of my Christmas gifts. 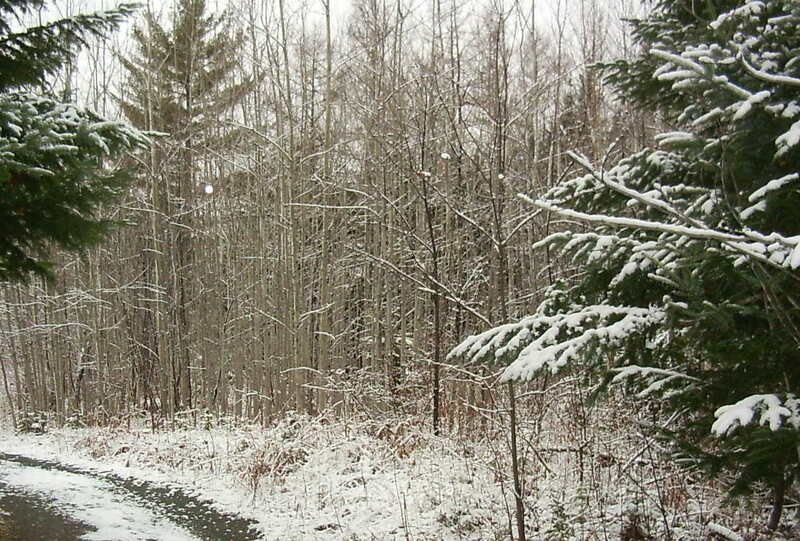 Earlier this week,we had a lot of rain and flooding during the storm while some areas of the province got snow. It took all our snow away. 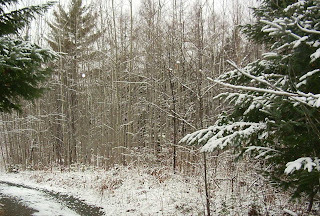 Yesterday and today though we got a light dusting of snow and this is what the trail looked like when I went out to walk just before lunch. 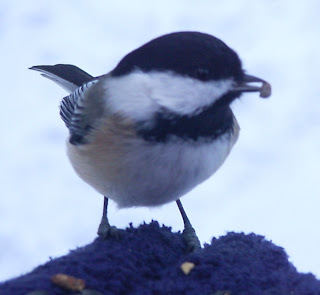 I always take a bag of bird seed and stop to feed the chickadees and nuthatches from my hand. 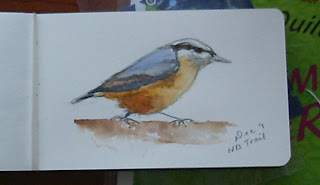 It is harder to entice the nuthatches but they will land if your patient. 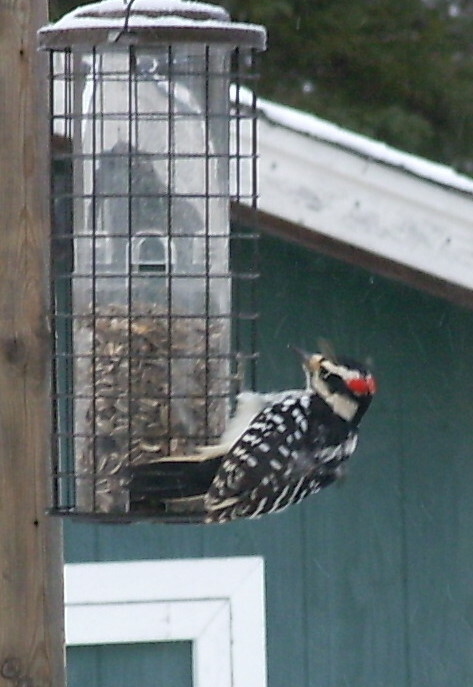 I managed to capture one that landed a the feeder in front of me. Last night I attended our guild's Christmas dinner which was very nice. as always there was lots of show and tell. 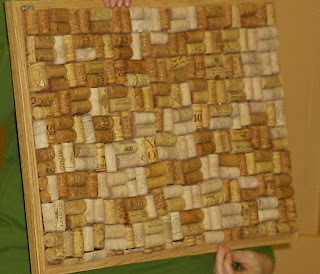 One lady has been collecting wine corks for some time; she made this cork/bulletin board. as if that wasn't enough, she made another bigger one in a frame. This tree tree skirt was made by friend of mine. It is made of wool and all hand blanket stitched. This afternoon, I'm puttering in my room. I put together a new little shelf for the bottom of my fabric closet and re-arranged a few things. Right now I'm following a crocheted ornament tutorial here. I post some pictures if I get one done. They are very colorful. I was up early, ate and tried out my new DVD, Walk Away the Pounds. I highly recommend it to use for those times when you can't or don't want to go out. It is simple and easy to follow yet has some variety and gets the heart rate up. 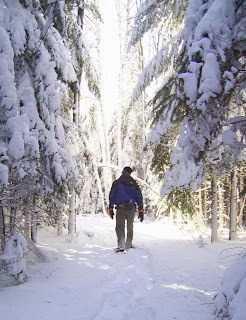 I really love to walk the trails but sometimes it's not nice out or I don't have enough time. with blood sugar issues I'm supposed to do something each day, preferably morning. I had a hair appointment at 11, so I did some errands first, had a quick sandwich at the bookstore/cafe, and then came home. I spent a half hour trimming a few more blocks for the orange zigzag quilt, hemming pants, ironing, and then I made these chicken tarts. 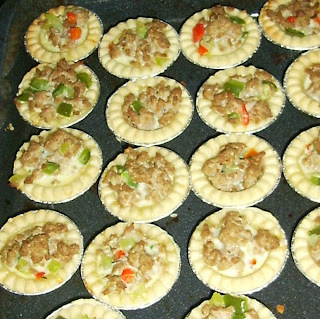 The recipe called for 1 pound of ground chicken, 1/4 cup onion, 1/3 cup sour cream, 1/2 tsp salt and thyme. It called for 1 egg beater. When I checked that out at the grocery store of course it comes in different sizes, so I just used a couple of eggs. I also added chopped celery, and peppers. I just want something a little different in the house for my one son who is not vegetarian. When I cook a vegetarian meal for the rest of us, I'll be able to pull a few of these out to go with it for him. Now, I'm going to get a bath to wash away the itchy hairs left from the haircut. I hate that! And, then I'm going out for our quilt guild Christmas dinner. I am in awe of all the sewing and crafting that's going on around the blog world. 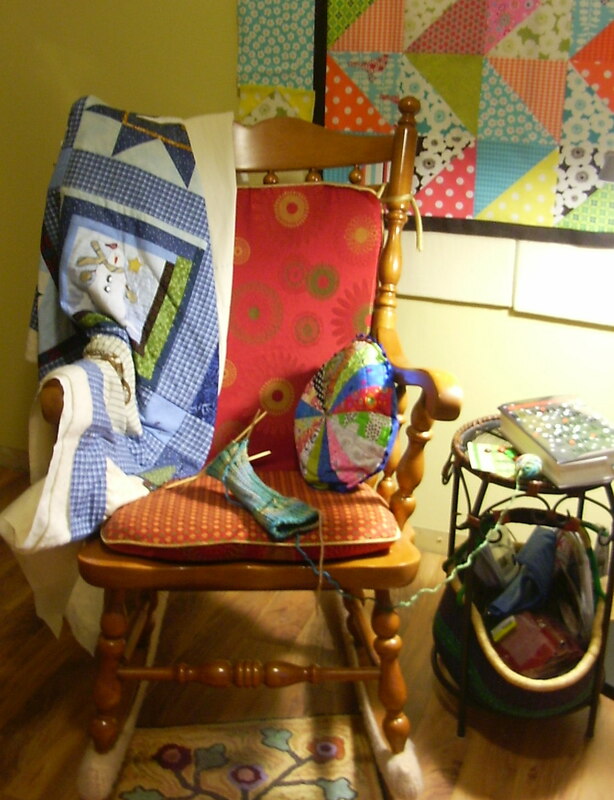 It takes me a year to finish a quilt (with a few things going on in the middle) and some people are whipping them up in a week for gifts! Amazing! I feel quite a sense of accomplishment today because I managed to finish putting these 2 little needle cases together. Now, in my defense I left the house at 7 AM for a test at the hospital that involved fasting and a rather disgusting drink of chalky barium. After that, I went home and had breakfast and then met a few friends for coffee. Following that, I had a doctor's appointment where I learned that my thyroid levels are still a little low, so I must up my dose. That explains my fatigue, and hopefully convinces you all that these 2 little needle cases were accomplishment enough for me today. I am satisfied, but maybe too tired to make supper. It was a dismal rainy day, and perfect for a group sewing day. I grabbed my 'Winter' quilt from my closet where it's been since last year. 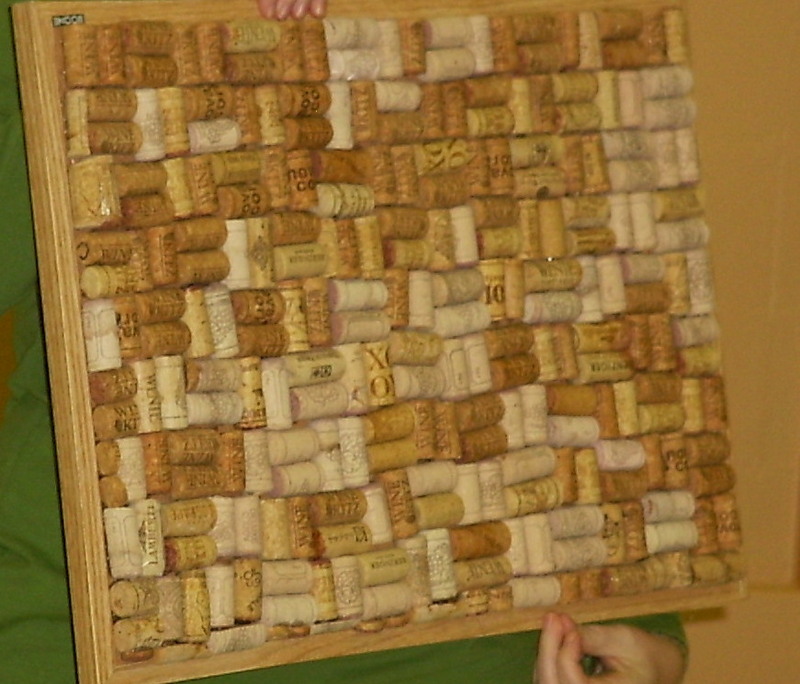 Each block was done by a friend in a monthly swap. At the end of 11 months (1 block per month), we had a party for the unveiling of all the blocks. Very exciting! Since it was already sandwiched, and I had started the machine quilting, it was easy to pick up. 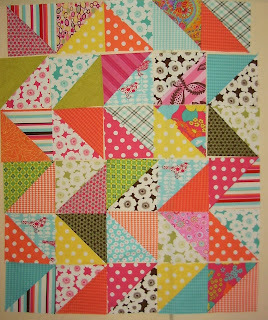 I got all the straight seams done and I started meandering in one of the blocks. I had to rip one block out twice when the machine was acting up on me. I stayed calm though. The Christmas music and happy chatter in the background definitely helped. I read the manual, made some adjustments, tested it first and at least got a block done. Now that I have it home I will use my everyday machine to quilt it. I had the little Jem Gold with me. That's my workshop machine. 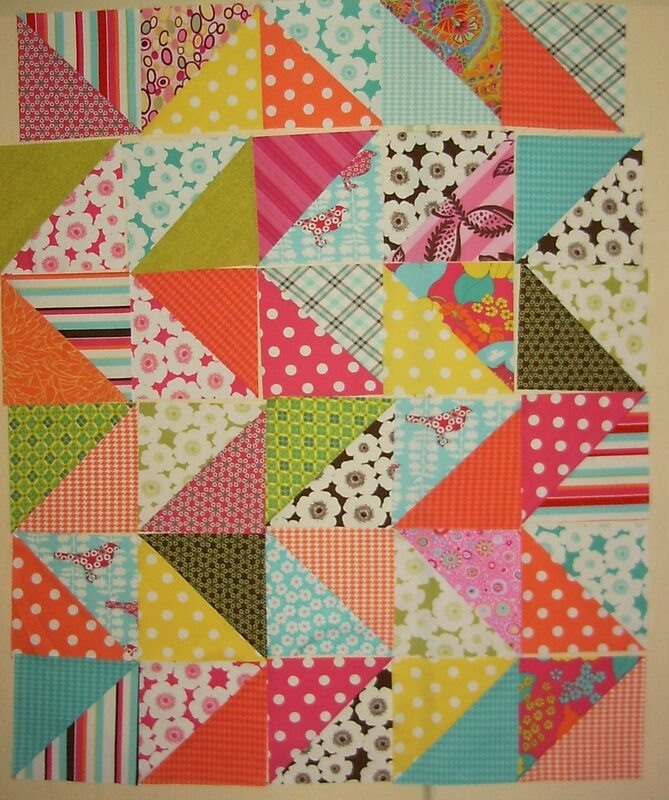 This is the start of a scrappy strip quilt by Nicole, that I was really attracted to. I love anything scrappy. Two sisters showed up with one of these each which they sandwiched and pinned together. 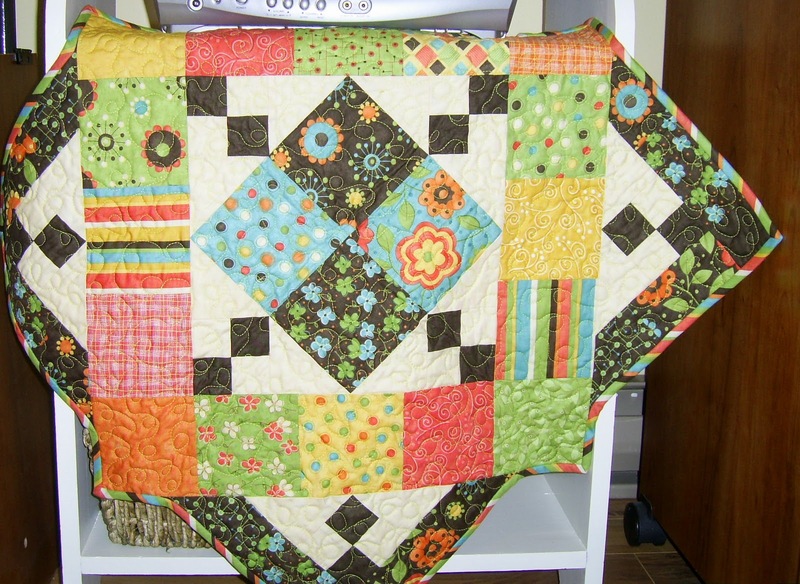 It is a rag quilt. If you look closely you can see cows and sheep and various animals on it. 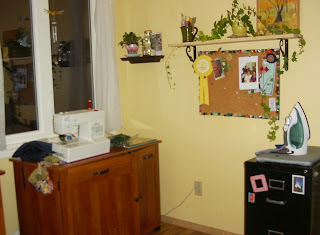 While I was out Gord put a new shelf up beside my sewing cabinet. It feels like Christmas! I planned to take away the bulletin board but it fit perfectly underneath the shelf. It was so worth it to pay someone to put my floor in. Two young men arrived at around 8 am this morning and were done by 10:30. I spent the time while they were cutting and banging making my soup and some rhubarb loaf for my friend. 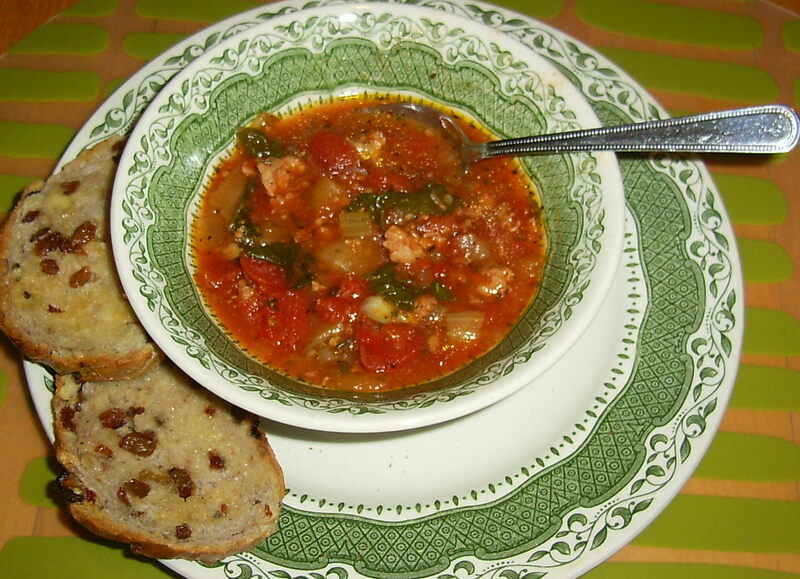 As I mentioned yesterday, I made my version of an Italian meatball soup with homemade low fat tomato basil pork sausage which I opened, scraped the meat out of, and finally, sauteed it with onions, and celery. Then I added a can of diced tomatoes, tomato juice and chopped bok choy. It was delicious. After lunch, I went to visit my very creative friend, Nicole. We had tea and we sampled a slice of the rhubarb bread. We got to chatting about our favorite blogs and were browsing some magazines when before you know it, the table was covered in old books, punches and papers. We can sure make a mess in no time! She had just cleaned house too. Our inspiration started here. To-night, once I got my room put back together, I just had to try sewing one together. It will be a cute topper for a gift. Well, except for this computer and a chair, the sewing room is empty in preparation for the laying of a new floor tomorrow. I'm so excited! That's why this week I've been baking and knitting. It's kind of relaxing. Today, I had a doctor's appointment this morning and then had to go for a blood test. It's the second time they did not test for what the doctor ordered. This is the salt water pool where I swim. I had to stand with my back to the 2 walls of windows which I would have like to have shown. 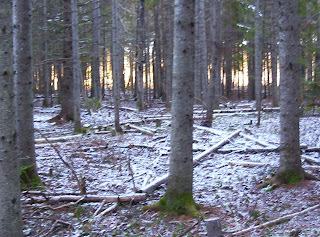 The view is of a field and woods and is always pretty no matter the season. When the sun is shining it shines into the pool. The pool is about 30 feet long--just long enough to get in some lengths--and there is a lovely whirlpool and sauna. I come home feeling very relaxed and a lot less sore. After that, I just had time for a snack and some knitting before I had to start supper. 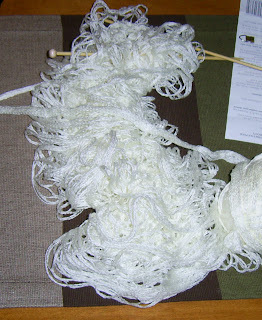 I'm knitting another of those lacy scarves. I quite like the white. Tomorrow, in the morning, I plan to cook up a large pot of my version of an Italian meatball soup. There is a local deli wheere they make a low fat pork sausage which I will use as the meat base. I'll put in a can of diced tomatoes and chopped bok choy. Finally there will be whole wheat noodles. I'm writing this now with out the picture as I won't have my computer on tomorrow. someday I will have a laptop. Then I will deliver a portion to a friend who is in need of a little break.